A legendary Philadelphia boxer who looks a lot like Sylvester Stallone once told the son of his most famous rival that “time takes everyone out, it’s undefeated.” At least that’s what we think he said, it’s kind of hard to understand him, with the way his mouth moves. Regardless, that statement has never rang more true then when we learned this week that Dr. Zizmor, who has graced our trains for decades, announced his retirement. We’ve already been hard at work, trying to find a new subway mascot to make the dreadful NYC commute bearable, but what about those legendary ads featuring the good doctor in front of a rainbow or the Empire State building? Will we have to scourge eBay to once again see, up close, the face of the man who promises us “clear, beautiful skin”? Thankfully, no. 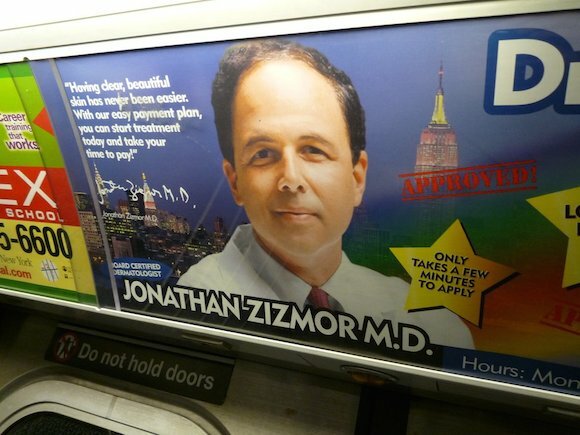 The Dr. Zizmor ads will forever be preserved inside the Transit Museum in Downtown Brooklyn. The good people at the Museum informed us on social media shortly after Zizmor announced his retirement that we would always be able to visit and look at the above classic Zizmor ad in a car mocked up with other period-specific ads. So now future generations of transplants can see the ads that New Yorkers who lived through everything from Ed Koch to Pizza Rat looked at, while waiting 20 minutes for the R train to move. The Dr. Zizmor ads will stand next to other legendary ads such as Etiquette Cat and perhaps those ads that promote breast surgery. Dr. Zizmoris gone, but those rainbows will keep on shining.